She has worked more than 22 years in the satellite communications industry, including extensive experience in rapid-response solutions for both military and civil agencies of the U.S. government. Ms. Sears has spoken widely on how commercial satellites can be utilized by the military to solve mission-critical needs and she has worked over the past several years to advance the commercial / DoD partnership. In 2009, Ms. Sears was appointed to the Presidents National Security Telecommunications Advisory Committee (NSTAC) to provide information, technical expertise, advice and guidance regarding issues that may affect national security telecommunications capabilities. Before joining Intelsat, Ms. Sears helped launch government services business units at both G2 Satellite Solutions and Verestar. She has also held sales and product development positions with Intelsat and Comsat World Systems. Ms. Sears has a Masters in Business Administration from George Washington University and a Bachelor of Science from the University of Richmond. Ms. Sears is currently serving on the Board of the Space Foundation, an international non-profit organization and the foremost industry advocate for all sectors of the space community. Thank you for taking the time to chat with our international audience, Ms. Sears. One point of conversation online in various blogs and mentioned when we are out and about at industry events is the sparsity of women in engineering and leadership roles throughout the SATCOM environs. Obviously, this glass ceiling has been totally destroyed by you in your leadership roles. This is a two part question: How did you manage to acquire your role with this important Company? I have been extremely fortunate in my career to work for excellent companies and, even more importantly, to have managers who were truly interested in developing my career. I did not experience the glass ceiling and always pushed myself to take on that next challenge or responsibility. I think for the most part, strong performance is rewarded. In todays market, companies cant afford not to. In your opinion, what recommendations do you have for women to move forward into new and exciting roles in SATCOM? I think women tend to underestimate themselves, or maybe they experience stereotypes. It is critical that women make their objectives known and that they understand what it takes to get to that next level. Maybe it is additional education or a particular skill set or experience. When you know what it takes, you can set your plan in motion. And what course work should women in school and college focus on to gain the education necessary for such roles as the industry moves forward? The killer combination in our business is a technical foundation in engineering with a business degree on top. I might add some IT expertise into the mix now given the networked world that we operate in and the growing importance of secure systems. The preceding question is also part and parcel of a larger industry dilemma, that of locating and hiring the best trained professionals for positions within a company. With the sciences and technology schooling failing miserably throughout our nations public school systems, how can our industry promote and encourage STEM training for our youngsters? And, how can we encourage youngsters to look to SATCOM and the space industry as exciting careers? It is incumbent upon all of us in the space industry to mentor young professionals and build awareness at early ages to the wonders of space, and the many ways in which it touches our lives, not to mention our freedoms. I suggest you look at what organizations like The Space Foundation are doing to expose young people to space and science, and to help teachers provide engaging lessons and experiments. Every company can help by introducing intern programs and scholarships, hosting family days and offering facility tours to local schools. It doesnt take much to get young people excited about spacespace is cool. Would you please explain your responsibilities as the President of Intelsat General? As the President of Intelsat General, my main focus is to develop, along with my team, a vision for the company. I look at what direction we want to go in order to grow our company and provide the most advanced services and technologies possible to our customers. Specifically, my responsibilities are to run the day-to-day operations of the company, much like a General Manager. I am responsible for Engineering & Operations, Accounting & Finance, Sales & Marketing, Business Development, Procurement and Contracting, Legal and Human Resources. I have a fantastic management team that obviously is a big part of the success of IGC. How did you develop the necessary experience to lead the Company? And what is your background in product development and customer relations? weather satellites, but then I made the jump to COMSAT and entered the world of communication satellites. Despite always wanting to be an engineer (I couldnt pass the Math classes), I did develop a deep technical understanding early on. My personality led me to Sales and I worked on the commercial side for many years. When the Gulf War happened, we realized that the U.S. Government was a big potential customer and they had growing requirements. So I left the commercial side of the business and focused on the government market. Listening to the customer is the first key for successful product development. Understanding their needs allows you to anticipate their future requirements and be ready with the services they want to buy. In satcom, this might be a particular coverage or feature like steerable beams. Developing a dialog and relationship with the many facets of the Government and military has been challenging because we are not a major integrator with large programs of record. However, we have introduced concepts like hosted payloads and cost-effective space procurements that are enticing to this community and so there is a growing dialog and understanding of different business models. Customer relations takes time and trust and while we have earned our stripes in supporting the military in the current war efforts, there is so much more we can do for them. The current cutbacks in military and government budgets by this administration in Washington DC must be a new and deeper wrinkle for commercial entities operating within these confines. How will Intelsat General, and Intelsat itself, manage these new variants, especially with future contracts? All of us in the government space market are in the vanguard of a challenging new era. Very difficult questions that havent been relevant for over a decade will now need answers. What programs do we keep? Which do we cut? Are there better, more efficient ways to accomplish a particular mission? Answering these questions represents a true culture change for many of our customers. Its been well established that individuals work through stress and grief in phasesDenial, Anger, and eventually Acceptance. Were at the initial phase of the governments reaction to the new budget culture for space, which Id call Hunkering Down. Its a natural impulse when faced with choices that have no easy answers. The walls come up, and the focus is on saving our programs. Its understandable, but unfortunate. Not only does this impulse prevent reaching out for help, but it also becomes such a focus that executing on the mission suffers. Hunkering Down also prevents any coordination among branches of the military, hurting chances for a coordinated and strategic response to this countrys space challenges, especially the balance of MILCOM vs. COMSATCOM. There have been some encouraging signs of change. It was a major goal of the 2010 National Space Policy to make more and better use of commercial networks that are already operational, proven and ready for use today. How were supporting the Navy through our CBSP program is a good example of that kind of approach. Additionally, the DoD is sub-leasing UHF capacity on the Australian Defense Forces (ADF) hosted payload on board the soon-to-be launched Intelsat-22 spacecraft. This hosted payload is saving the ADF over $150 million and cutting years off deployment time. The U.S. Government could realize similar benefits by leasing hosted payloads directly from commercial operators, and indications are that they are slowly moving in that direction. Programs like these are why Im optimistic about the future, despite the tough budgetary climate. There are many facets to Intelsat General...are there any particular areas that are the most appealing to you? Based on the changing relationship with the U.S. Government and the growing demand for satellite capacity, we see hosted payloads, and ISR, specifically UAVs, as key areas that we will support. For hosted payloads, we see some very encouraging signs within the government. First, we are preparing to launch the UHF hosted payload for the ADF on IS-22. This is scheduled for late March and will give the Australians much needed UHF capacity to support tactical communications. This payload will also provide the U.S. DoD with additional capacity as part of their contract with the ADF. In addition, we see leadership in the U.S. Government moving in a positive direction. For instance, the addition of a hosted payload office within the U.S. Space and Missile Systems Center is sending a very clear signal to commercial operators. This needs to be followed by action, but it is clear that hosted payloads are becoming a central part of the dialog on how to affordably address space missions. Increased UAV construction and use is a huge growth driver for the satellite communications industry right now. The withdrawal of troops doesnt mean that reconnaissance needs will decrease and we see some cases where they will even go up. As some DoD officials have recently said, fewer boots on the ground means more eyes in the sky. At the same time, civilian use of UAVs is on the rise. And, with the increased budget pressures on the U.S. federal government, other governments may become more interested in financing their own UAV efforts, which will be good for the market as a whole. We also see communications on the move as an important opportunity to support our government customer. They have come to depend on their ability to send and receive data from any location, and they need high data rates to do so as effectively as possible. We are looking at many ways to use our fleet of satellites to support this requirement. How can the Department of Defense (DoD) more effectively use commercial satellite operators to meet the growing demands of UAVs/UAS communication and ops? Demand for UAVs and bandwidth to support them would be a good place for the DoD to start working with commercial operators more effectively. These platforms have changed the communications landscape dramatically over the last 10 years. They require large amounts of bandwidth to carry the data and video they collect and transmit to support intelligence gathering. The UAVs enable military users to see this information in real-time from the field. A good example has been the increased capability to monitor roadside bombs that were killing so many troops. Even as the troops are withdrawn from theater, use of UAVs will probably increase to ensure that reconnaissance can continue at the appropriate level. The commercial satellite industry has enabled the DoD to achieve its missions since it entered Iraq and then Afghanistan, as their own satellite resources could not meet and still cannot meet their demand for satellite communications. On Intelsat alone, they use bandwidth on 11 satellites to support the growing number of drones as well as the sophisticated sensors on them. We are only one provider and, based on this demand, we all play a critical role. The U.S. Government needs to work more closely with commercial operators in supporting the warfighter. By doing so, we can better plan our future satellites to provide the most advanced capability and capacity available. This planning should also include long-term funding in the budget so that the DoD can get the most cost-effective pricing for these resources. There is nothing more important than the ability to save warfighter lives and ensure mission success for our nation and our allies. Where do you see SATCOM and its various related industries heading over the next year or so to cement such necessities in place for our security and defense? Satellites provide a critical capability for saving warfighters lives as satellites send information from the field to military planners for analysis that enables critical decision making. They also send collaborative information from military leaders back to the commanders and the warfighter to enhance their situational awareness. I see this requirement growing as satellites continue to play a vital role for military communications. There are clear trends that point to bandwidth demand growing even as American troops pull out of current engagements around the world. This will be due to the growing emphasis on special operations and more UAV flights. These kinds of operations demand a different kind of military and superior situational awareness, all of which require more satcom resources. Another area of importance is that of hosted payloads... how can hosted payloads effectively address the USG budget constraints for satellite communications? Hosted payloads offer government customers an expedited method to access space on an economical basis as compared to stand-alone military satellite programs. By hosting a payload on a commercial satellite, customers share launch, insurance and construction costs. This dramatically decreases the overall cost for the same capability as you could have on a stand-alone bus. While this saves significant amounts of money, the government customer can still have complete control over the payload. In addition, a hosted payload on a commercial satellite provides government planners with access to multiple launches each year in a variety of orbital locations, providing much needed flexibility in terms of timing, location and types of payloads. All of these factors make deployment of capability faster and more cost effective. The Australian Defence Forces recognized this cost issue and told us that they see a savings of $150M by acquiring a payload instead of building their own satellite. Referring to the former question, what procurement changes must the U.S. Government make in order to more effectively, and efficiently, use the commercial satellite sector and subsequently save taxpayer dollars? Is there an example you can relate that shows how a government programs needs were more effectively met through commercial means and application? Since the wars began, SATCOM has been funded predominantly by supplemental funding, and often leased on a yearly vs long-term basis. Intelsat has argued for years that the government could realize substantial savings by planning ahead and leasing capacity on a long-term basis. As I mentioned before regarding the savings cited by the ADF, this may seem like small numbers based on the needs to cut billions of dollars from the budget, but every dollar counts and everything should be on the table as the government rethinks its procurement strategies. The Navys CBSP network is a great example of how Intelsat General can provide a more comprehensive solution. First, this network is global and operates at multiple frequencies. The Navy needs to add, move, change bandwidth based upon operating conditionsand they need coverage over a lot of blue water. The wideband military systems can, and do, provide some of the critical communications for the Navy, but CBSP offers them flexibility and worldwide coverage that they control. There is no queuing for access or waiting for circuit activations. This type of private, commercial network offers the Navy a robust solution to their needs, utilizing over 17 satellites in Ku-band, C-band and X-band and over seven different teleports. There is always a lot of explanation necessary by a commercial entity when moving forward through the GSA process. How do you address the claims by the USG that commercial satellite services are more expensive than military satellite services? I know there have been many references to commercial satellite services being too expensive to serve the requirements of governments around the world. I believe that two issues are involved here. First, the DoD is buying the majority of commercial satcom on the spot market at short-term rates, which is inefficient and costly to the taxpayer. Since the DoD does not commit to industry for their future requirements, industry cannot customize solutions and the DoD gets what is available. We look forward to the opportunity to propose better pricing when the government gives us any kind of long-term commitment and works with us to plan for their future needs. The second issue I see relates to how the DoD cites the costs for its military satellite systems. It is difficult to determine how much an overall system costsend-to-endwhen one agency is responsible for the platform and then another for the ground infrastructure, and so on. If these costs were combined with the launch price, on-going operations, and the costs for delay and failures, the costs for the military systems would be much higher. Commercial satellite operators like Intelsat quote prices for satellites that already include all of the elements named above. 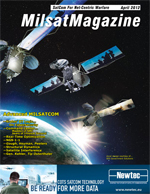 Im not sure if just comparing the costs of milsatcom vs commercial is the only debate. The Government needs their own satellites for certain mission sets, like nuclear command and control. For other requirements and missions, the U.S. Government should consider different procurement approaches. Commercial leasing may be good for a set of baseline communications networks, like the Navys CBSP, and these should be leased long term because they are not likely to change dramatically over time. The more productive approach is to create an architecture that clearly differentiates what needs to be owned and operated by the Government for security reasons and what can be provided by commercial operators at substantial cost savings. Trusted Partner or Taken for Granted? Commercial SATCOM providers can sometimes come off as being a little whiny. After all, the need for bandwidth by military users continues to surge, and the military has no choice but to rely on commercial SATCOM to support the warfighter. Why don't we all just pipe down, and appreciate the business? Well, try to put yourself in our shoes. Imagine if you've been doing a job for over 20 years, and doing it very well. Yet you were never given a formal job offer, or even an exact job description of what your role was supposed to be. Plus, you were never given any kind of commitment, never told when you would no longer be needed. That's the current situation for commercial SATCOM providers. Ever since Desert Storm in 1991 the U.S. military has relied on us to provide the bandwidth required by network- centric combat missions. Back then commercial SATCOM was considered a "last resort," to be used only as augmentation to military SATCOM. Then in 2004, the introduction of UAV flights really turbocharged the need for flexible, reliable SATCOM. Fast forward to today, and the "last resort" has now become indispensable. But this dramatic reversal of roles has happened without any forthright conversation or planning. As I've previously written for this blog, commercial SATCOM provides the lion's share of ISR-related bandwidth needed by the military. And the need for that bandwidth is expected to double by 2018. So why is SATCOM still being purchased at spot market pricing, which is inefficient and more costly for the American taxpayer? To be clear, there will always be a need for a partnership in space between commercial SATCOM and SATCOM the military owns and operates for themselves. But even the most optimistic forecasts for military satellite construction and launch have commercial SATCOM playing a major role for at least another decade. And those projections ignore the production delays and overruns that have plagued military satellite programs in recent years. It's past time for commercial SATCOM to move from temp to perm. Let's have a healthy dialogue that will allow the commercial space industry to make the investments necessary to continue meeting the needs of the warfighter. As the military adjusts to a new budgetary culture, let's work together and realign priorities to match today's ISR realities and commensurate bandwidth requirements. All we're looking for is some respect and a clear job description going forward. We've earned it.